Green Team Gazette: Sad, But True ~ "The Baltimore Sun" Ousts "Outdoors Girl"
Sad, But True ~ "The Baltimore Sun" Ousts "Outdoors Girl"
This weekend I learned some very sad, unfortunate news on the environmental front for the state of Maryland. The Baltimore Sun--Maryland's 175 year old newspaper and the one that has the largest circulation in the state--has decided to completely eliminate their Outdoors Section. This decision was publicized this past Friday, July 15th...and it has met with some distinct public outcry. "So what?" you ask. "Why does that matter?" you ask. It matters plenty. Some would say (and have said so on the newly-formed "Save the Outdoor Sun" Facebook Page) that this is a "travesty." The reasons are numerous...especially for a state like Maryland. Maryland has 4,300 miles of shoreline with both the Chesapeake Bay and the Atlantic Ocean. With mountains to the west, beaches to the east, and state parks galore in between, Maryland is a state for outdoor enthusiasts. Activities like hiking, fishing, boating, crabbing, biking, canoeing, kayaking, camping, and hunting all create an outdoorsy person's dreamland. Of course, if the Outdoors Section of The Baltimore Sun goes away, that means: away goes Candus Thomson...and her expertise of the Bay (as she IS The Baltimore Sun's chief "Outdoors Girl." The void becomes a chasm. For the past dozen+ years, Candus Thomson has written about, advocated for, and shared stories of adventures (not to mention an exposé or two) of the Chesapeake Bay. Over here at Green Team Gazette, we've been fans for multiple reasons. I've followed her "Park Quest 24/7" the past two years and celebrated her triumphs. I've heard her tell whoppers of fish tales to my daughter's second grade classroom at Eagle Cove School as a guest speaker (not to mention, inspire them to be writers). I've followed her "Outdoors Girl" blog from The Sun. Plus, on a few rare occasions, my family has even been lucky enough to camp, fish, and Park Quest, a time or two with her. I've seen my daughter and her best gal pal watch Candy in an "I am woman hear me roar" kind of awe as Candy has succeeded swiftly in a traditionally male-centric, outdoorsy world. Word on the street (or rather the Save The Outdoor Sun Facebook Page) is that The Sun's publisher Tim Ryan has stated that Candus' writing talents will be picked up by The Sun's Metro section. Consolation prize, if you ask me....or anyone who has read her column and seen her forté. Why is The Sun doing this? Rumors run the gamut. It could be that it's from a dwindling readership so this is an economic decision. Another thought is that The Sun would rather have more column space for the upcoming football season. Perhaps we'll never know. So in this state that leads the nation with its environmental advocacy, this is where The Sun, our leading state newspaper, is taking us? They are loudly stating that our state and its natural resources are not important. No, this is not responsible journalism; not in the least. "Maryland needs someone to keep a watch over the bay and let us know what is going on. Candy was that someone. She did an excellent job of it.... Who is going to be the voice of the Chesapeake?" "I am the Lorax, and I'll yell and I'll shout for the fine things on Earth that are on their way out.... I am the Lorax. I speak for the trees. I speak for the trees for the trees have no tongues." 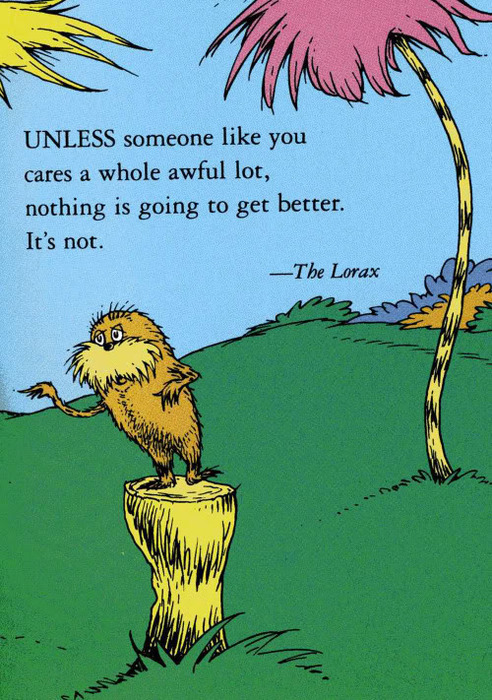 Of course, when thinking of The Lorax , it reminds me of the other words of wisdom in this same book: "Unless someone like you cares a whole awful lot, nothing's going to get better. It's not." So here we have The Sun, taking away from us that "someone who speaks for the trees" and the whole of the Chesapeake Bay...."someone who cares a whole awful lot,"and makes all of us care with her humor, wit, wisdom, and pointed truth. That "someone" who is named Candus Thomson and her Outdoors Section. And we will be left with what? Not what we need, at least not what we need to be the environmental leading state that we could be. Responsible journalistic decisions? No, Baltimore Sun, this is not. Please reconsider this grave error. --Enlist the help of your friends by sharing these avenues and encouraging them to do he same. Thank you Vicki! We need to make The Sun leadership aware that this is a large mistake. Maryland is an outdoors state, and Marylanders deserve outdoor coverage. People can help by sending a quick email to to the publisher, or join the facebook group you mentioned above and find other ways to help save this important column and blog!